The first symptoms of verticillium wilt are blotchy yellow lesions on the lower leaves, rather than a wilting plant as the name implies. The verticillium fungus thrives in moist, cool soil. It affects many vegetable and plant varieties including cucumber, radish, and beet to name a few. 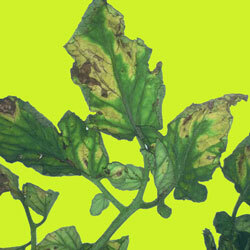 Yellow, blotchy lesions first develop on lower leaves. Tan-colored V-shaped lesions on leaf tips. Wilting of the entire plant may occur during the hottest part of the day. Split open a stem lengthwise to diagnose. Tissues will be brown, especially near the soil line, but can extend upward 10- to 12-inches. Fungi are present in garden and greenhouse soils where they can persist for many years. Caused by the fungi Verticillium albo-atrum and V. dahliae. The disease survives between seasons on dead plant debris remaining in the soil. Can multiply in common weeds, including cocklebur and ragweed. Infection occurs at moderate temperatures (13˚C to 30˚C/55˚F to 86˚F) in saturated soil. Plant disease resistant varieties (labeled V for Verticillium). Plant tomatoes only in well-drained soil. Practice crop rotation on a long four-year cycle with nonrelated-hosts (no peppers, potatoes or eggplant). Don't saturate the soil by over-watering. 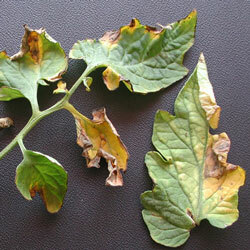 By far the best remedy is to avoid the disease by planting Verticillium-tolerant tomato varieties. Soil fumigation may be your best option if soils are severely infested.